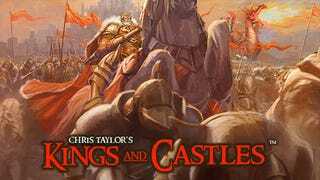 The developers of Supreme Commander, Dungeon Siege and Demigod have announced their next project (despite Supreme Commander 2 still a few weeks off), the real-time strategy game Kings and Castles. First footage of Chris Taylor feeding a horse below! While Kings and Castles promises an "epic," "one-of-a-kind experience" that will feature "the ability to zoom to any level, incredible maps, and eye-popping visuals," the only related media you'll see today will be Gas Powered Games founder Chris Taylor gathering resources by chopping wood and wrangling chickens. The extent of the head-to-head action is little more than Taylor trying his hand at horse diplomacy with a carrot and that horse biting him in the arm. Kings and Castles is planned for release on PC and "next-generation" consoles, which really means current generation consoles like the Xbox 360 and PlayStation 3, based on the logos at the game's official web site. That site does feature a piece or two of concept art, confirming that kings, castles and what appear to be dragons will be appearing in the game. We're sure that Gas Powered will have more details on Chris Taylor's Kings and Castles in the coming weeks, but for now enjoy footage of a game developer rubbing elbows with livestock.